All the architectures discussed so far have their own advantages and disadvantages. Monolithic systems are quite fast but their expansion is very difficult. Layered structure gives an efficient division of functionalities but if the number of layers is very high, it is difficult to manage the system. Microkernel architecture is quite efficient in isolating the core functionalities within the microkernel but the other services which are outside the kernel are not properly integrated. And hence the idea was to combine the best functionalities of all these approaches and hence this design is termed as the hybrid structured operating system. 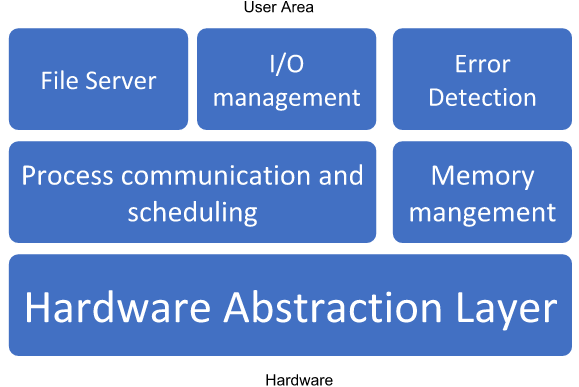 Hardware abstraction layer: It is the lowermost layer that acts as an interface between the kernel and hardware. Microkernel layer: This layer is nothing but the microkernel only which comprises of the three basic functionalities i.e., CPU scheduling, memory management, Inter-Process Communication. Application layer: This layer is in user area and acts as an interface between user space and microkernel layer. It comprises of the remaining functionalities like file server, error detection, I/O device management etc. In this way, the modular approach of microkernel structure and the layered approach both are restored, keeping the no. of layers easy to manage. So, hybrid approach is highly useful and is largely used in present-day operating systems. Most of the Mach operating systems run on this hybrid architecture only. Easy to manage due to layered approach. Number of layers is not very high. Kernel is small and isolated.